Cornwall is a paradise for the hiker or casual walker. 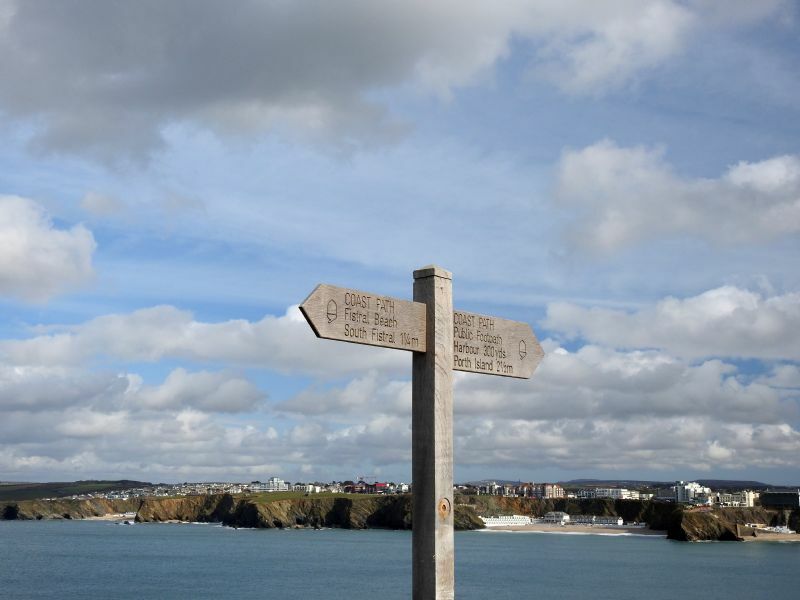 In addition to its wealth of beautiful inland walks, Cornwall has 228miles/ 431kms of coastal footpath stretching from Marsland Mouth on the North Cornish Coast to the Hamoaze and Plymouth Sound on the South coast. Whether you enjoy walking through picturesque tree lined riverside valleys or on rugged rocky clifftops, Cornwall is the ideal walking location for you. For long distance hikers and walkers there is plenty of accommodation including hostels and camping sites available en route and for those of you who prefer less strenuous walking there are hundreds of short and circular walks to inspire you, giving you a taste of the beauty and uniqueness of Cornwall. Cornwall has many walking routes and trails. 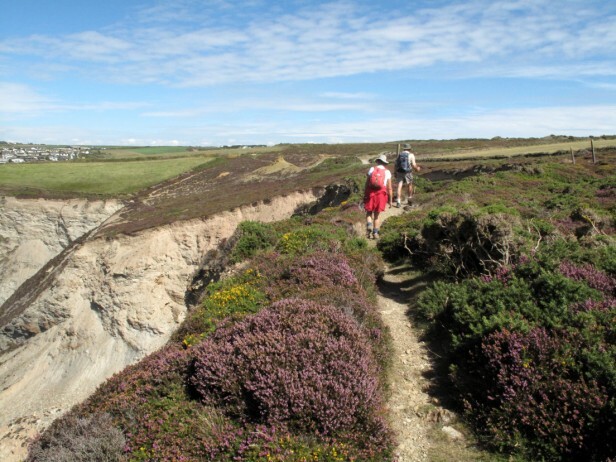 The Cornish Way, although originally promoted as a cycling trail is also for hikers. 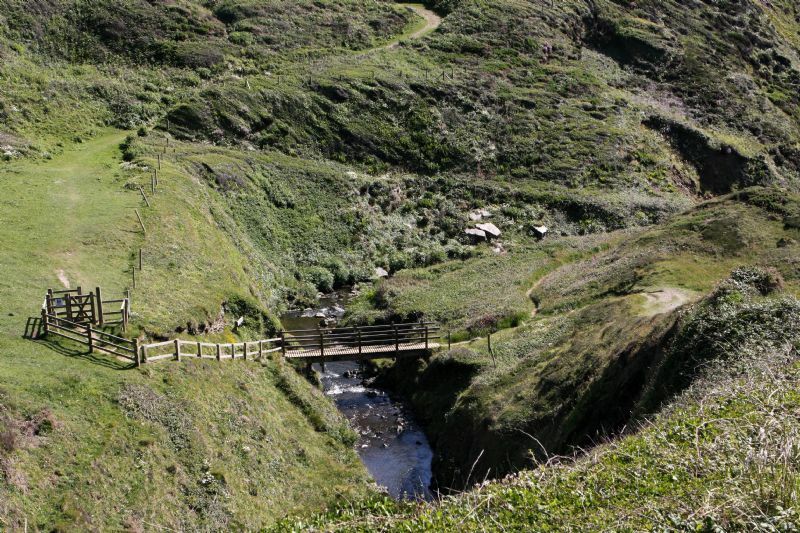 The 180 mile (288km) trail from Bude to Land's End consists of 6 individual trails. The Mineral Tramways Trails are an extensive network of multi-purpose trails which take you on a tour through Cornwall's history. There are 7 trails in this network. Each of these hiking trails in Cornwall is featured in the links below with details of that trail, a map of the trail and information on places to visit along the trail. Please click on a link to view the trail information. 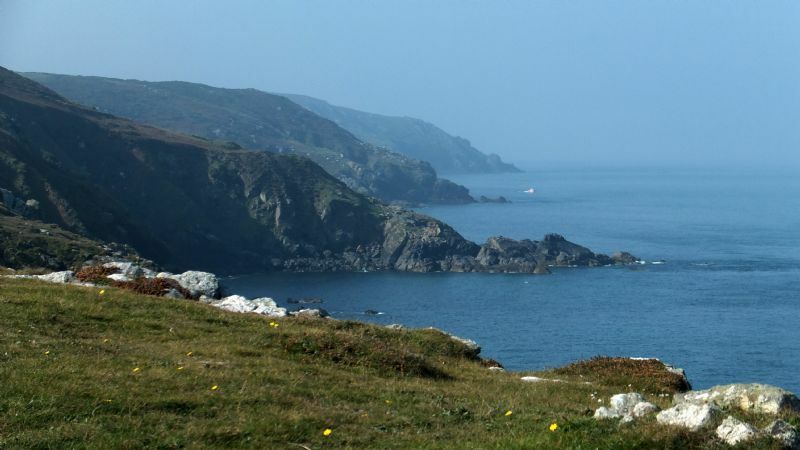 The Cornwall Coast Path is the longest trail in Cornwall at 431km (228 miles). There are a number of long distance walking trails in the interior of Cornwall some of which cross from the North to the South coast. The Saints Way, in Cornish Forth an Syns, is one of these. The 38 mile path retraces the footsteps of the missionaries from the Dark Ages as they crossed Cornwall from Padstow to Fowey. The trail can be walked in short stretches from parish to parish for casual walkers or for seasoned hikers as a long distance walk. The Camel Trail is another route popular with both walkers and cyclists. This stretches from Padstow on the north Cornish coast, following the magnificent River Camel towards its moorland origins at Poleys Bridge on Bodmin Moor. Tehidy Country Park offers a range of walking trails with something suitable most abilities. A number of areas within the park are level and have access for wheelchair users. Tehidy Country Park is a free admission country park accessed from either the Camborne Redruth Area or from the North Cliffs between Gwithian and Portreath. The Forestry Commission has a number of properties within Cornwall which have walking trails. These include Idless Woods, comprising of Bishop's Wood, Lady's Wood and St Clement Woods; Deerpark Forest at Herodsfoot; and Cardinham Woods, which have four walking trails within them, Wheal Glynn Walk, Lidcutt Valley Walk, Callywith Wood Walk and Lady Vale Walk. Many towns and villages produce walking guides for their individual areas. One such guide is that published by Dorothy Gill-Carey of St Agnes which is reproduced here with her permission. It shows a number of fine walks in the beautiful parish of St Agnes. Please click here to view the map and walks (available soon). For more walking & hiking locations in Cornwall see the list below the map. Many of Cornwall's towns and villages produce their own walking trails. For more information enquire at local Tourist Information Offices. Walks in and around Falmouth and Truro every Tuesday. Fun, mixed group of ladies and gents who meet at Princess Pavilions on alternate Tuesdays for a Falmouth based walk. All of the Falmouth based walks have an option for a shorter 20 - 30 minute walk if needed. On the remaining Tuesdays the walks are at many different places. There are a total of 20 different walks. Please ring Linda Broomfield (Co-ordinator and Walk Leader) on 07974 234335 or 07542 934388 for more info. Anyone can come along and join in and there is no charge. Organised by the Helston and District Footpaths Society. Visitors and new walkers welcome. Please arrive at the start point a few minutes early for registration. Walks are led by trained walk leaders. Walkers walk at their own risk. Dogs must be kept on a lead. In adverse weather, please ring a leader to check if the walk is going ahead. Godolphin Trust10, free 5 or 10K multi-terrain run on the fourth Sunday of every month. Trust10 is a free way-marked trail run for all abilities to enjoy the Godolphin estate. It's free, it's fun, it's informal. Godolphin Trust10 is two laps of 5K, so 5K runners and walkers are welcome too. Registration is at 8.30am at the Godolphin Welcome Hut and the run starts at 9am. The Piggery will be open for teas, coffees, cake and socialising after the run from 10am. The route is only way-marked on Trust10 day, but you can check out the Godolphin Trust10 map and give it a try any time. This is a multi-terrain trail run, so we definitely recommend trail shoes for clambering over the hedges and negotiating the mud. Please bring your own timing device if timing is important to you as this is an informal event and we don't provide timing. Marshalling is also limited, and the event relies on volunteers to make the magic happen. We recommend this event for over 14 year olds to run the 10K, and under 16s must be accompanied by an adult for the run. Dogs can join in on the lead, as long as you're happy that they'll be able to manage the hedges. Don't forget to bring your change for the car park (and for cake afterwards if you fancy it) or proof of National Trust membership to park for free. We have an amazing team of Trust10 volunteers, but we're always looking for more help with marshalling, setting up the route, welcoming the runners and back marking. Learn about island life with our daily tours. Join one of the free daily tours and hear about the families that call the Mount home, view the buildings that have played key roles in its history and discover what life here today is really like. Knills Monument, Trencrom, Trembethow, Rosewall Hill and field paths to St.Ives. Meet Higher Tregenna Road between Tregenna Castle Hotel and Tesco. Non members are welcome to join the walk. 5km run - not a race, it's you against the clock. Penrose Estate, Porthleven Road, Helston, Cornwall TR13 0RA. It's free! but please register before your first run. Only ever register with parkrun once. Don't forget to bring a printed copy of your barcode (request a reminder). If you forget it, you won't get a time. Everyone runs for their own enjoyment. Please join in whatever your pace! It is entirely organised by volunteers - email penrosehelpers@parkrun.com to help. Every week we grab a post parkrun coffee in the lakeside Café - please come and join us! The event takes place at Lanhydrock House, Bodmin, PL30 5AD. It is entirely organised by volunteers - email lanhydrockhelpers@parkrun.com to help. Every week we grab a post parkrun coffee in the local cafe - please come and join us! Upper Tamar Lakes, Kilkhampton, Bude, EX23 9SB. Tamar Lakes parkrun needs you! It is entirely organised by volunteers - email tamarlakeshelpers@parkrun.com to help. Every week we grab a post parkrun coffee in the Tamar Café - please come and join us! Mount Edgcumbe House and Country Park, Cremyll, Torpoint, Cornwall, PL10 1HZ. Mount Edgcumbe parkrun needs you! It is entirely organised by volunteers - email mountedgcumbehelpers@parkrun.com to help. Every week we grab a post parkrun coffee in the Stables Café - please come and join us! It is entirely organised by volunteers - email trelissickhelpers@parkrun.com to help. Every week we grab a post parkrun coffee in the National Trust Crofters Cafe open from 9.30am with outdoor and indoor seating - please come and join us! Eden Project parkrun needs you! It is entirely organised by volunteers - email edenprojecthelpers@parkrun.com to help. Every week we grab a post parkrun coffee in the Eden Kitchen - please come and join us! Heartlands, Pool, Redruth, TR15 3FB. It is entirely organised by volunteers - email heartlandshelpers@parkrun.com to help. Every week we grab a post parkrun coffee in the Red River Café - please come and join us! The Ordnance Survey publishes the Explorer series of maps which are ideal for walkers. Available in local bookshops or click on the links below to order online.